Feta cheese has an intense, tangy taste. 4 What Type of Microorganism Is Used to Make Cheese? Feta cheese is traditionally made using sheep's milk, but most modern commercially-produced versions use cow's milk instead. You can buy sheep's milk feta from small independent farms and imported from countries like Greece and Bulgaria where traditional methods are still used. Feta has an intense flavor, and is popular in salads and cooked Mediterranean-style dishes. One wedge of feta cheese, which weighs about 1.33 ounces or 38 grams, makes up a single serving. A serving contains 100 calories, 71 percent of which come from fat. Because feta cheese made from sheep's milk has a higher fat content, the calorie count per serving may be slightly higher, depending on the specific producer and the method used to produce the cheese. The total fat content of a wedge of feta cheese comes to 8 grams of fat, about 12 percent of the recommended daily value. However, saturated fat makes up 6 grams of this total, about 28 percent of the recommended daily intake of this type of fat. 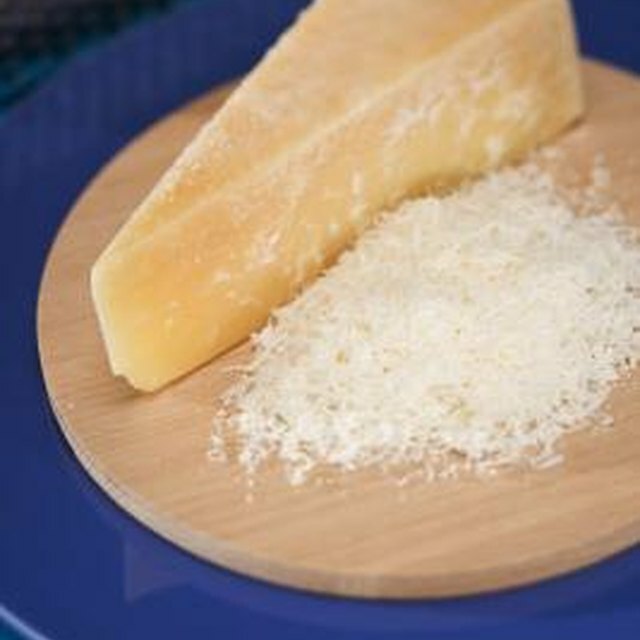 The carbohydrate content of feta is 2 grams, and a serving of this cheese contains 5 grams of protein. A wedge of feta contains 34 milligrams of cholesterol and 424 milligrams of sodium. You can soak feta in water for a few minutes prior to use to decrease its sodium content, according to PCC Natural Markets. A wedge of feta cheese supplies 187 milligrams of calcium, or 19 percent of the daily recommended intake. Calcium is important for the prevention of osteoporosis, colon cancer, migraine headaches and PMS, which also states that calcium from dairy products, including feta cheese, is better for bone health than calcium acquired from supplements. Feta is also high in phosphorus, providing 128 milligrams, or 13 percent of the daily value. Other important minerals present in feta cheese include iron, magnesium, manganese, selenium, zinc and potassium. Feta cheese has 0.3 milligrams of riboflavin, 19 percent of the daily recommendation, and 0.6 micrograms of vitamin B12, 11 percent of the recommended daily value. 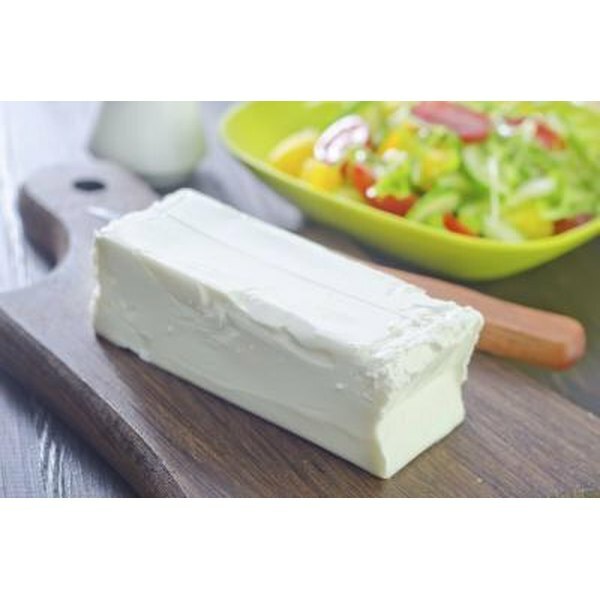 It also contains Vitamin A, thiamin, vitamin B6, choline, niacin, folate, vitamin K, pantothenic acid and vitamin E.
Since feta cheese is high in sodium, cholesterol and saturated fat, it should be eaten only as an occasional indulgence, not with every meal. Nonetheless, the nutrients in this dairy product make feta a good way to incorporate dairy into a healthy and balanced diet. Feta made from sheep's milk may provide more of a nutritional boost, as sheep's milk contains higher levels of vitamins and minerals than cow's milk, explains Nutra Ingredients. How Much Fat Is in Feta Cheese? What Are the Benefits of Eating Cheese?